Expertise in marine shell dating. Our laboratory is also equipped with 10 Perkin Elmer 1220 high precision spectrometers and 4 state-of-the-art AMS graphitisation lines. The Waikato Radiocarbon Dating Laboratory was established in 1974 by Prof. Alex Wilson in anticipation of geomorphology and tephrostratigraphy projects looking at landform processes in the Waikato region. Initially the laboratory was run as a research unit measuring radiocarbon determinations for staff and student projects. During the first five years 304 determinations were measured. In 1979 Alan Hogg took over the running of the lab and worked closely with Dr. Henry Polach (formerly Australian National University) improving the vacuum lines and counting procedures. Our AMS combustion lines were first built in 1996 by Dr. Tom Higham (now Oxford University) and our graphite lines started producing commercial AMS samples in 2002. In 2007 Fiona Petchey visited the Keck Radiocarbon laboratory in Irvine, California and worked closely with Dr. John Southon improving our AMS processes. Since 1980 we have run over 37000 radiometric and AMS samples. During this time the popularity of AMS has grown from only 4% of our total throughput in 1996, to around 80% in 2015. 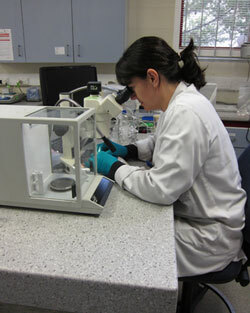 Seven staff are now employed in the University of Waikato Radiocarbon Dating Laboratory. Watch the video below to find out more about the Radiocarbon Dating Lab and Advanced Technical Officer Kathleen Dabell - winner of the KuDos Science Excellence Laboratory Technician Award 2018.